Here’s a look at available fresh produce loads in the Western half of the USA where volume is primarily steady, or increasing. In South Texas, avocados from Mexico are providing over 600 truckload equivalents per week and the volume will be increasing in the weeks ahead….South Texas grapefruit loadings are very light, but have started, and will hit good volume around mid- November….In West Texas in the Hereford area, as well as in nearby Eastern New Mexico, there is light volume with potatoes. Looking at the San Luis Valley of south-central Colorado, about 500 truckloads of russett potatoes are being shipped weekly. Idaho has another huge crop of russet potatoes. While the railroads move a significant amount of the state’s spuds, the majority of the volume still is shipped by truck. Nearly 1,700 truckload equivalents of potatoes are providing loads on a weekly basis. California’s San Joaquin Valley is shipping everything from grapes to carrots and tomatoes, among other items. Over 2,000 truckloads of grapes are being shipped weekly from vineyards spread between the Bakersfield area to Merced. Decent volume with tomatoes also are available, but a seasonal decline will continue in coming weeks. In Washington state, apples from the Yakima and Wenatchee valleys may be providing the single largest amounts of fruit volume in the country. A huge apple crop is averaging about 2,500 truckload equipments on a weekly basis. Potato haulers should find the quality of Maine’s potato crop this year to be the best in a number of years. Last year, growers were plagued with too much water and a disease known as blight. The Maine potato harvest was recently completed, which is always a race against finishing before the first hard freeze, which damage spuds remaining in the ground. The majority of the state’s spuds are shipped throughout New England, the northeast and as far south as the mid-Atlantic states. 55,000 acres of Maine potatoes were harvested this year. This is small in comparison the nation’s biggest shipper. Idaho has increased its acreage by 25,000 every year for the past several years. This year, the state is reporting 345,000 acres. In 2011, it planted 320,000, and in 2010 it had 295,000 acres. Idaho has increased in just two years the equivalent of the entire state of Maine’s production. By comparison, Wisconsin has 63,000 acres, Colorado and Maine are at 55,000, Minnesota 51,000, Michigan at 46,000, Oregon has 41,000, and New York 17,000 acres. Added together, these states tally 332,000 acres, 13,000 less than Idaho alone produces. Most of Maine’s potatoes are grown and shipped from Aroostock County, the state’s largest county. It is the northern most county in the state and has a population of 71,482 as of 2011. In the Native American language it means “beautiful language” and is aptly nicknamed The Crown of Maine, in part because of its location. The number of acres of farm land devoted to potatoes has decreased in recent years because of rotational crops, conservation and fewer farmers. However, in the year 2000, Maine grew 63,000 acres of potatoes and nearly 90 percent of that was in Aroostook County. A huge Idaho potato on a flat-bed truck is once again hitting the road this year as part of the Idaho Potato Commission’s (IPC) television advertising campaign. The Kenworth is pulling a giant tator that weighs 12,130 pounds, which the IPC claims equals 32,346 medium sized potatoes. Additionally, the famous fitness guru Denise Austin will once again be the celebrity spokesperson for Idaho potatoes. The IPC big Idaho potato truck, on its seven-month national tour will conclude its trip just in time for the Produce Marketing Association’s (PMA)annual convention and trade show in Anaheim, CA late October. The IPC’s new ad campaign premiered on national television on ESPN during the recent Boise State vs. Michigan State game (MSU won 17-13). The IPC ad program will be on national cable television beginning in mid-October” and continuing through February. the campaign will be carried on a variety of news programs such ase CNN and FOX News, as well as the Food Network, The Cooking Channel, HGTV, and The History Chanel among others. In other activities, Denise Austin “will be doing two different public service radio announcements” for the commission. Produce haulers found plenty of potatoes for hauling out of Idaho last year (season) and this time around there will be even more, if predictions hold true. The nation’s biggest shipper of potatoes expects to have a volume for the 2012-13 shipping season that is 8 percent more than a year ago. Nationally, 5 percent more spuds are forecast to be shipped. Idaho has a whopping 345,000 acres of potatoes planted. It’s true that the early variety norkotah russets harvest has been underway about a month. However, the tale of how many loads will be available this season comes with the main variety from Idaho, the russet burbanks. Still, with 25,000 more acres of spuds in the grown this year, Idaho most likely will have a huge amount of shipments. Of course, not all of these loads will be by truck. Potatoes are a prime candiate for rail shipments every year – and the railroads do haul a significant amount, particularly out of Idaho. Nationwide, total planted acreage is estimated at 1.15 million. The figure includes plantings from all four season, with fall plantings being about 1 million acres alone. The actual potato volume for the fall season will have a better handle come November 9th when The USDA will issue a new crop estimate. A primary threat to a reduction in loading opportunities is if an early, hard frost or snow hits the Idaho farming areas. This could damage potato crops. Thus, farmers will be harvesting quickly as possible through October to beat cold weather. 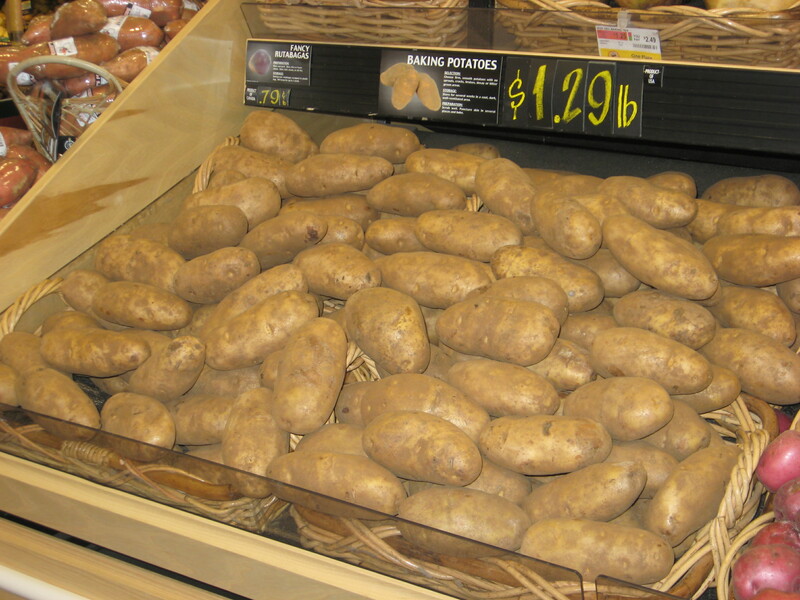 Idaho potatoes – grossing about $4300 to Atlanta; $5500 to New York.